Rain Gear Rally for Obama in Juneau! When I got an email a couple weeks ago from the organizer of the Obama rally in Juneau that happened this past Saturday, I thought to myself, “Why are they calling it a Rain Gear Rally?” It’s two weeks from now…how do they know? Then I remembered. It’s Juneau. And sure enough, those intrepid waterproof souls we know as Juneau Democrats, braved the freezing rain and wind, and were out there for the cause. A big wave from your compatriots in the north, Juneau! Keep up the good work! McCain Palin Rally vs. Obama Biden Rally in Anchorage! The Blow by Blow. Once again, there were duelling rallies here in Anchorage. The McCain-Palin rally was held in the just-completed Dena’ina Convention Center in downtown Anchorage. The Obama rally was held outside, just a couple blocks away, at the Delaney Park Strip. One would think that the Republican rally celebrating the hometown girl, in her very very red state would have drawn a huge crowd, and that the Obama rally would be a few brave intrepid souls with a couple signs shivering by the side of the road. One would be wrong. The Obama rally was all set up and running when I arrived – tents, face painting, t-shirt sales, voter registration, postcard writing to swing states, a huge stage and sound system. By 1:00, there were more than a thousand people milling around with signs, kids, dogs and huge smiles. This was definitely a feel-good place. Hundreds lined the roadside waving signs to appreciative honking motorists, and hundreds more milled around the tent area. Anchorage mayoral candidate and former legislator Eric Croft got up and spoke, so did Kat Pustay who’s heading up the Obama campaign in the state. Then came Ethan Berkowitz, Democratic candidate for the U.S. House seat currently held by Don Young. Ethan welcomed his “fellow revolutionaries”. The crowd went wild. I looked at my watch. It was after 1:30 and I knew if I didn’t get to the McCain Palin rally soon, I’d never go. So I ripped myself away from all the positive energy and the fresh air, and hurried over to the Dana’ina Center. 3 people stood outside waving signs. I figured I had to smile, so I did. “Come on in, we’re having a rally!” one of them effused. I took a big cleansing breath, and in I went. I just had a feeling this rally wasn’t going to have as big a crowd as the Obama rally, because the rally that was held for Palin herself, when she was in Anchorage a few weeks ago only had about 500 people show up. But I walked into the room and I really was stunned. I felt like I had entered an empty chair convention. It was really bad. I actually felt sorry for the organizers for a minute, before I snapped myself out of it. A head count yielded about 250-300 people. Clearly they had been hoping for more. A lady scooted up to me and said, “We’d really like everyone to be up at the front and towards the center, not all spread out.” Ah…can’t have the news cameras getting all those chairs. I scooted up and way over to the side so I wouldn’t get on film. And look, there’s Meg Stapleton sitting among the empty chairs. That was it for me. Had to leave. On the way out I noticed clip boards with the “support Palin” petition. Someone behind the table said that this was “against those people” (described as ‘Obama operatives’) who were smearing Palin and that “we just want to support her.” I didn’t sign….being an “operative” and all. Crossed the street, and there I was again, back at the rally of “hate, anger and fear” listening to a great local band, and watching kids with painted faces dancing in the grass, smiling people registering voters, busy postcard-writers, cheering sign-wavers, and a community brought together by a shared desire to move the country in a new direction. Clearly I was at the right rally. Meghan Stapleton had no problem finding a seat. 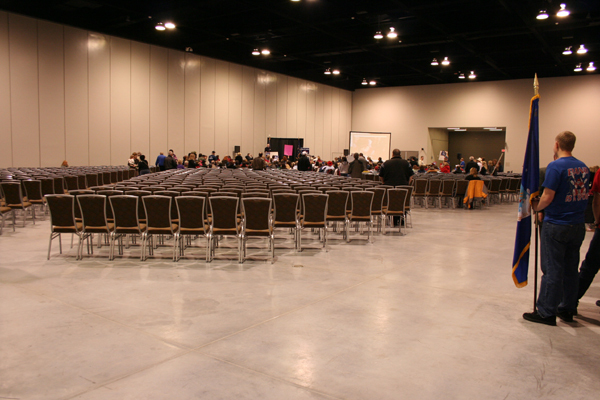 The front of the room at the Palin rally. Slideshow at right. Ah, the escape! If I can just get past Meg Stapleton, and that sea of chairs!! One of several piles of “mystery mud” closing 9th Ave. to traffic. And the Mudflats Award for Bravery Goes to… Wasilla Democrats! 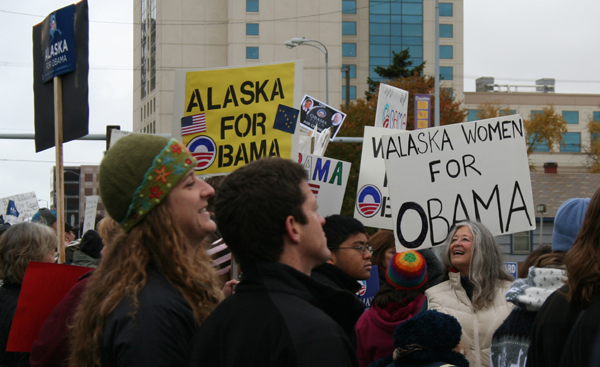 Obama supporters in Wasilla, Alaska! Yes, you heard right. A group of intrepid Obama-Biden supporters stood in the rain beside the highway in downtown Wasilla, waving signs and cheering as people headed home from work. Several rally-goers called in to Alaska’s progressive talk radio station KUDO to report on the event. By 5:15 they had about 25 people at the rally. OK, before you think that’s not much…trust me…it’s a LOT, especially for Wasilla and especially considering that this is, basically, the heart of enemy territory. According to one caller, there were lots of people honking and giving the thumbs-up. Of course, there were also those who chanted Sah-rah out the window. But the fact that the Wasilla event happened, that 25 people showed up, that passers-by honked and gave the thumbs up at ALL is amazing. So, a big hat tip and a sweeping bow to the bravest folks in the land! And for those of you who feel compelled to look…..the pit bull button is HERE. Don’t say I didn’t warn you. Here are some more pictures from last night’s Alaska Primary. 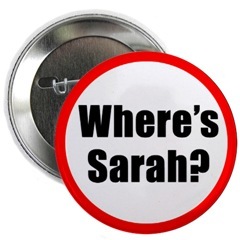 Still no winner in the Don Young/Sean Parnell fight to the death, and there won’t be for another couple weeks. The absentee ballots will figure heavily into this epic contest, where the two are only slightly more than 150 votes apart. Don Young is hanging on by his fingernails. I came across another non-partisan who took the Republican ballot to vote for Young hoping he’d get taken out in the general election by Ethan Berkowitz. If I came across four in the last 24 hours without even trying, there must be many many more out there. And if Don holds on, it’ll be the progressives that let him live to fight another day. That, plus a final surge of cash from the Democratic Party bashing Parnell. Politics does indeed make strange bedfellows. And, of course, Sean Parnell being the Lt. Governor is in charge of the Division of Elections which will be counting the votes…. Just when you think the knot couldn’t get any more tangled.